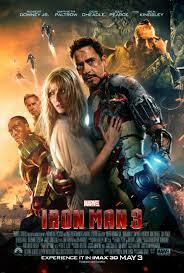 Review: Iron Man 3 – Geek Girls Rule!!! Iron Man 3 Movie Poster. Iron Man 3 has a ’60s pulp spy novel vibe wed to irreverent black humor, giving it a different flavor than its predecessors. But it works. Oh, does it work. In the wake of his near-death experience in The Avengers, Tony Stark aka Iron Man (Robert Downey Jr.) is obsessively struggling with PTSD and a loss of confidence, and his relationship with Pepper Potts (Gwyneth Paltrow) is a rock he clings to. Of course, the Mandarin (Ben Kingsley) and Aldrich Killian (Guy Pearce) have plans that will put Stark, his world, and his relationship in extreme danger. Director Shane Black (Kiss Kiss Bang Bang) successfully replaces Jon Favreau in the director’s chair. Despite only one film as a director to his credit, and a modestly budgeted one without significant visual effects at that, Black seems completely in his element with a mega-budget blockbuster loaded with visual effects galore. What he brings beyond that are ultra-cool pulp stylings and a knack for black humor, an approach that keeps the franchise’s third entry fresh. Where many superhero franchises stumble with film number three, this one may have actually just hit a new high, and, yes, I’m aware that’s a bold statement. The screenplay by Black (who began his Hollywood career in the 1980s by writing Lethal Weapon) and Drew Pearce (creator of the British superhero sitcom No Heroics) delivers the expected superheroics with an unexpected dose of irreverent, even subversive, black humor. It takes the genre requirements seriously enough (though it may be as its weakest, relatively speaking, when it does), but it’s frequently funny and has a tone that perfectly manifests through the character of Stark. The writing is really an extension of the Stark persona, punctuated in the film by Stark’s narration. Perhaps the most subversive thing Black and Pearce pull off is their brilliantly funny twist with the Mandarin. I won’t spoil the twist, but I applaud it, especially since they had to know the fanboy/girl literalists would howl in dismay. Let ’em howl. The twist works. While there’s much action involving the Iron Man armors (yes, in the plural), some of the most entertaining action scenes are just Tony Stark sans armor or sans much of it. This could easily be a pulp spy novel called Tony Stark: Man of Action, or a Marvel Cinematic Universe take on James Bond (the final end credit even riffs on 007 with “Tony Stark will return”). Or, hell, even MacGyver, since Stark has to whip up some improvised weaponry in the field (which is pretty much what happened with his original armor in the first film). I would have liked a little more time spent delving into Stark’s PTSD, but that’s a minor quibble and doesn’t reflect on the overall quality of the writing. Cinematographer John Toll (Braveheart, Cloud Atlas), production designer Bill Brzeski (Catwoman, The Hangover), and costume designer Louise Frogley (Constantine, Quantum of Solace) are responsible for realizing the pulp spy novel vibe visually while keeping it consistent with the look of the Marvel Cinematic Universe as a whole, and they consistently succeed. The score by Bryan Tyler (Constantine, The Expendables) is a muscular beast that fits the story. It took seventeen companies, and more money than most of us can probably imagine, to create the visual effects. Mission accomplished. They’re seamless and dazzling, and it’s nice to see a film where the effects serve to complement a good story rather than to replace one. What to say about Robert Downey Jr. He fills the shoes (and armor) of Tony Stark as effortlessly as Sean Connery filled Bond’s shoes. His contract is up, but one hopes Disney opens their treasury for him for at least The Avengers 2 if not Iron Man 4, too. Downey always strikes the right balance between self-centered egotist and hero, and charms the audience even when his character is being a jerk. In this film, he gets to show another side of Stark, one traumatized by events in The Avengers. The Dark Knight Rises showed the physical toll being a superhero takes, but Iron Man 3 shows the emotional toll it can take. Ben Kingsley. What he lacks in screen time, he more than makes up for with a scintillating Janus-headed performance. First he’s absolutely chilling (rivalling Heath Ledger’s Joker even), then later he’s amazingly funny, coming close to stealing the film from Downey. When they share scenes, it’s electric. I’d buy a ticket just to see their characters sitting or standing around for two hours. I really would. My Dinner with Tony and the Mandarin. Or even Waiting for Godot with Tony and the Mandarin. Yes. Gwyneth Paltrow has always been an ideal Pepper. She can play Stark’s romantic interest while also impressing upon us that she’s a brilliant woman who’s the one who really keeps Stark’s life and business empire on track. This time, she also gets in on some of the action, subverting the damsel in distress trope just a bit. Don Cheadle’s second go-around as Stark’s military buddy Rhodey, who became War Machine in Iron Man 2 and is re-branded as Iron Patriot here, works especially well with the story’s tone. There’s a certain buddy cop genre ambiance to his relationship with Stark, and Cheadle plays that quite well. At first glance, Guy Pearce’s performance as Aldrich Killian seems to fade into the background, but that works for the character, and like Kingsley, he gets to play his character two very different ways. The all-around solid cast also includes Rebecca Hall as Dr. Maya Hansen, a scientist whose work is key to the story; James Badge Dale as Eric Savin, the Mandarin’s main muscle; Stephanie Szostak as another Mandarin operative, Ellen Brandt; Jon Favreau as Stark’s former bodyguard, Happy Hogan (a role he played in the previous films, which he also directed); Ty Simpkins as a kid who befriends Stark (he has good chemistry with Downey in their scenes); Paul Bettany reprising his voice role as Stark’s AI, JARVIS (who gets several fun scenes of his own this time); and William Sadler and Miguel Ferrer as the US President and Vice-President respectively. Iron Man co-creator Stan Lee has a blink and you’ll miss it cameo as a beauty pageant judge. Mark Ruffalo reprises his Avengers role as Dr. Bruce Banner in the humorous post-end credits scene, continuing the friendship that developed between Stark and Banner in that film. Iron Man 3 is made of win. Go for the action, stay for the irreverent black humor, pulp stylings, Robert Downey Jr., Ben Kingsley, and a subversive twist. Marvel, if there’s an Iron Man 4, please do everything you can to bring back Messrs. Downey and Black.